At Work: hard at work carving wood; Channapatna, Karnataka. 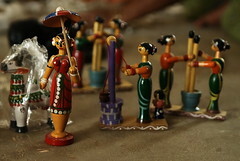 Channapatna toys are a particular form of lacquerware made specially in the town of Channapatna using wood and colored with safe vegetable dyes in simple and colorful forms. We were there on a Saturday morning to see how they were made. Our starting point was the Lacquerware Craft Complex on Tatekere road. A workshop here has been setup by the KHDC as a common facility centre where anyone can use the lathes for a monthly rent of Rs.90. A bunch of people were busy working at their stations when we went. Each bench with eight stations/lathes is powered by a single motor and distributed with belts which can be engaged and disengaged by a easy flip of the hand. There were four such benches but only three of them were in active use while the other gathered cobwebs. The bunch were working on different things: bangles, curtain holders, wheels for a toy car, parts of a keychain and more, and they told us that they only work on only one type of piece the whole day. Keeping their finished products in locked boxes under the benches, they tell us that most of what they make goes to the Cauvery Emporium while they manage to sell a small percentage to other shops in Channapatna. 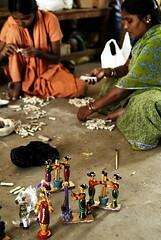 They get their wood and lacquer from the town market and use their own set of tools to make the toys at the craft complex. 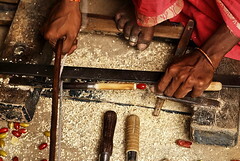 And they have been doing this for most of their lives: Dhasharatham who was that day making the beads that go to cover a car seat tells us that he has been working with wood for the past 30 years, 10 years in a private factory and then 20 years at that complex. Samajulla who was about to leave for lunch volunteered to take us around the area to have a look at a few more workshops. The government workshop is only one among hundreds of workshops present in Channapatna. 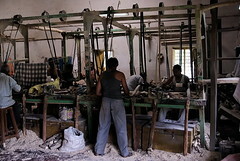 A private factory was close by where people work for a salary unlike at the government workshop. Their orders come from places as far as Hyderabad and Kolkata with the design being given in a spec sheet. Other than the private factories many people have smaller workshops in their home itself. While many people work on motorized lathes, there are a few using manual hand-driven lathes to make small parts. We met a lady named Rukkamma who was using a hand-driven lathe in a small space behind their home while baby-sitting a neighbor's kid. A few others do not work with lathes at all but are called artists who paint the smaller wooden pieces that go to make a toy and involve themselves with assembling the toys. 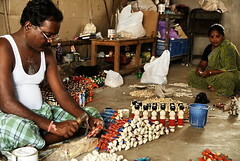 We came across one such artist, Hanumantha, who was busy attaching heads to the bodies of the toys while pieces of hands and legs lay in bunches all around; his wife and daughter were working along side him on other smaller pieces. 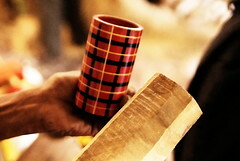 Other than the lacquerware, there are also factories working with wood, making cricket bats and wickets, photo frames, trophy bases, spectacle holders among other things. We ended our trip by visiting a wholesale shop on MG Road in Channapatna; we had bought a few things from the workers at the craft complex and all of them were cheaper at the wholesale shop, we were surprised but not disappointed. 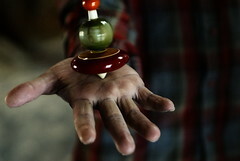 Hand made wooden toys. Huh. Who knew people still did that? and it is protected by a Geographical_indication too. Thanks for the behind the scene sneek-peek into the world of chennapattna toys - nice post Sandy. You are back to work or still travelling ? Thanks Shiva. Was working in Apr and May but now in between jobs! Very interesting. I loved the pictures. I've always been fascinated by these toys. I really want to visit channapatna. The only memories I have from childhood are buying toys when the bus stops there on the way back to Bangalore i think.. Thanks for posting this. The post was a good one. 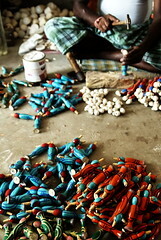 It would be a great help to me if you could share the contact details of these artisans. I live in Chennai and am planning to visit chennapatna sometime next week. Get to Chennapatna and then ask for the Government Lacquerware Craft Complex on Tatekere road, it is very easy to find and from there you can walk around to other factories nearby. i've driven thru' channapatna so many times, almost once a fortnight, and was wondering how i cud have a closer look at the craftworks. thnx a lot for all the useful info and beautiful pictures. Thanks, these folks are very friendly, so drop in there and try buying directly from them. wil v get permission to work with them for a documentation??? 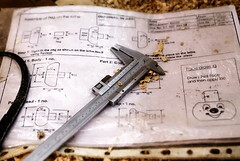 I love wooden toys (http://jacktedanddolly.co.uk/) and it is great to see the photos of them being made in such a hand crafted and skilled manner. 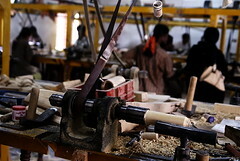 can u plz tell me the tools they use..
As you can see, a lathe, wood and lacquer. Hi, We want artisans to do job work. any idea, who to contact, .....number anything?!! Sorry, you will need to go to Channapatna.